On this date in 1946, the postwar state of Yugoslavia executed a trio of World War II occupation figures. Left to right: Leon Rupnik, Erwin Rosener, and Lovro Hacin. An Austro-Hungarian subject by birth, Leon Rupnik followed his native Slovenian soil into (proto-)Yugoslavia after the empire collapsed in World War I, and climbed the military ranks in the interwar era. General Rupnik, as he could then be called, was the man tasked with engineering fortifications along the Italian and Austrian borders to ward off a fascist invasion. Modeled on the Maginot Line and every bit as effective, the Rupnik Line was little more than a speed bump when the Germans and Italians swept in during April of 1941. But Gen. Rupnik was an open Nazi sympathizer, so sentimentality for his failed bunkers scarcely deterred him from joining the new occupation government as an enthusiastic collaborator, and he served or a time as the president of the German puppet province and the mayor of its capital, Ljubljana. Erwin Rosener was a onetime brownshirt who became an SS General and was tasked by Heinrich Himmler with suppressing partisan resistance in Slovenia. He did the usual dirty things such a job entails, ordering torture and executions of hostages; Gen. Rosener also helped Gen. Rupnik organize the right-wing paramilitary Home Guard (Domobranci). Lovro Hacin, the third member of the doomed party, was the police chief of Ljubljana. Rupnik was shot. Rosener and Hacin were executed by hanging. 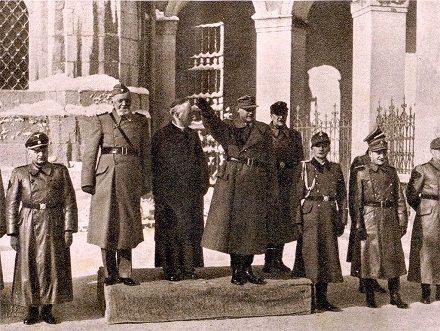 Rupnik (leftmost on the platform) reviews fascist Dombranci militia with Bishop Rozman and (rightmost) Gen. Rosener, January 30 1945. Three others escaped execution at the same trials. Vilko Vizjak and Mha Krek both drew prison terms; Bishop Gregorij Rozman did as well, but his trial occurred in absentia and Rozman lived out his in exile.